The world’s fourth-largest magnitude quake of 9.0 was caused when the Pacific tectonic plate slipped under the North American plate, causing a massive movement of the Japanese landmass to shift Eastward. Specifically, Japan has just moved towards the North American continent by about 13 feet. As we have all witnessed on television, the downward thrust of the plates released a gigantic tsunami force that surged over Sendai, Japan, to a distance in land of 6 miles, unleashing a power that is calculated to be approximately 500 million times more powerful than the Hiroshima atomic event in 1945! Clearly, even though the impact of the seismic profiles can be calculated down to the inch, there is much more study to be done of the fault lines involved and the oceanic features that have changed. We look at the devastation and we want to feel this was a singular event, however, we are here to tell you this has happened before, maybe on an even greater scale. According to the best seismic experts in Japan, the geophysical changes from the earthquake that happened on March 7, 2011, came from a depth of 15 miles and shifted the Earth’s axis by 6.5 inches, shortening the day cycle by 1.5 microseconds, and sank the country of Japan downward by two feet. Reportedly, due to this massive earthquake, there are currently land masses that have now slipped under the water and are not expected to resurface in the near future. Having visited the area of southern Japan called Yonaguni, I (JJ Hurtak) have, first hand, witnessed during an expedition, six man-made structures that are now underwater. The expedition examined only six of the numerous underwater structures in the area that appear to have been above ground as recently as 10,000 years ago. This is the theory of some local scholars like Dr. Kimura, Professor at Naha University of Okinawa. These underwater temple-like structures and platforms resting on the bottom of the ocean floor may provide a clue that this type of destruction has happened before where massive and devastating fluid dynamics brought changes that could be traced to the major oceanic and tectonic plates at the end of the last ice age (9-12, 000 years B.P.). 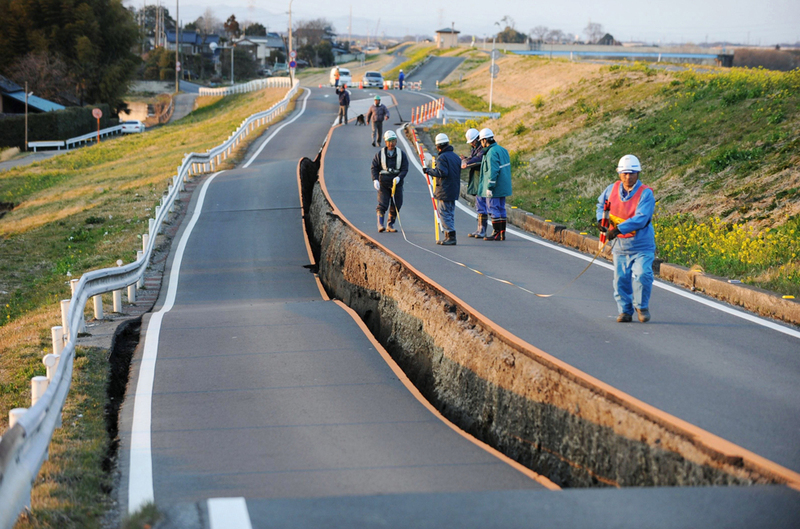 It appears that Japan has been the location for many massive geological changes. Prior to the last ice age, we assert it was a gathering place for an ancient Asian people who built gargantuan temples and land platforms along the ocean frontiers of the Sea of Japan when the ocean was lower by 150 to 200 feet. In fact, there is solid evidence that Japan was once part of the mainland of China, but similar cataclysmic changes caused a breaking away from the larger continent. Although we have stated that an advanced culture, a skillful temple building society, was destroyed by cataclysmic changes in the ocean, this was not accepted by most archeologists. They did not acknowledge that these events were in the recent past, nor that advanced cultures existed over 10,000 years ago. We beg to differ. Instead, similar, cataclysmic changes as we have just seen in early March 2011 may have instigated such legends as the ‘Motherland of Mu’ amongst the peoples of the Pacific as far away as Easter Island (within the territory of Chile). Legends record that Mu sank into the Pacific Ocean due to cataclysmic events. More specifically, some of its remaining structures have been found in the Ryukyu islands (southern Japan), including the area of Yonaguni, which were part of ancient ceremonial centers and ocean trading routes, according to Dr. Masaaki Kimura. In fact, The Keys of Enoch® also point to this area surrounding Taiwan and the Philippines as a key grid point on planet Earth, indicating our cataclysmic past. Such catastrophic changes may have brought the peoples of the East to the New World, arriving in both North and South America. Overwhelming tsunamis and the sinking of the coastal land masses may have been the fate of the larger continent of Mu which once existed between Japan, the Philippines, Indonesia and southeast Asia. Stephen Oppenheimer, Professor at Oxford University, confirms that ancient, civilized cultures existed 10,000 years ago in his breath-taking book Eden in the East (1998). Do we need to take a look at the footprints of ancient civilization off the coasts of modern Japan to find answers to our own future? We believe the answer is yes. There may be additional changes upon the earth and we need to be prepared as a society to face these sudden changes. The earth has gone through several massive quakes from the 8.8 earthquake in Chile to the 9.0 earthquake in Japan. Perhaps, these are the harbinger of things to come in the Pacific Basin, where we may see the sudden collapse of modern building structures along the Western oceanfront of the Americas, especially California. Moving to the Caribbean Sea off the eastern seaboard of North America, researchers have found over the past decades interesting, yet allusive underwater structures off of Bimini Island, called the Bimini Road. In addition to a regular series of blocks that look like a roadway, pyramidal structures have been reported, as well as other regular building-like foundations. This also may have been the legendary land of Atlantis. Additional evidence of geological change has been seen off the coasts of India and in the Mediterranean. Our planet has been going through shifts and changes since its inception, and mounting evidences suggest that many societies were destroyed during or around the close of the last ice age about 9,000 to 12,000 years ago. The “sinking” of Mu and Atlantis may have not occurred simultaneous to each other, but may have been two separate events captured in their local mythologies. It will be helpful to make a closer examination of evidence on the ocean floor. We are suggesting that more information and visual input needs to be acquired on the massive evidence of interesting structures found off the coast of the southernmost Japanese islands that may have been terraformed before changes at the end of the last ice ages. We send our prayers to those in Japan, as the devastation is clearly overwhelming, but we suggest that everyone take a ‘second look’ to closer examine these historic underwater stone structures. Filmed on the ocean floor off of Yonaguni and Taiwan by some of the best underwater film makers, the structures can be seen in the documentary called the ‘Temple of Mu’, in DVD format that can be ordered from the Academy for Future Science,www.keysofenoch.org.